November is almost here and much is still not known about the specific launch date of Microsoft’s latest flagship phones, the Lumia 950 and its bigger brother the Lumia 950XL. 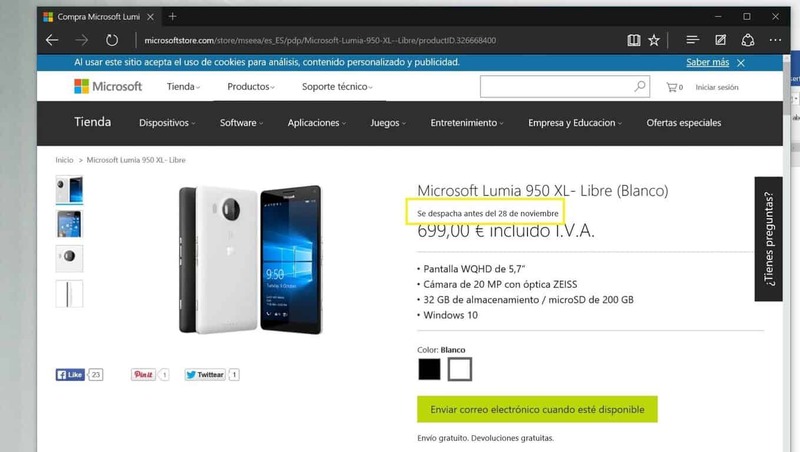 But the listing of the 950 and 950 XL for the Microsoft Store Spain is indicating that the phones will launch at the very end of November, possibly on Black Friday, as the listing says the phones will ship by November 28th. This listing is for the unlocked versions of the new phones and there is still no indication of carrier launch dates, or more generally which carriers may be on board with the Lumia 950 or 950XL besides AT&T in the United States. Hopefully though, today’s listing of November 28th means that the launch is close. And with that certainty closing in we are sure to be near the point in time when carriers and Microsoft itself will have to start announcing hard dates in the coming wave of promotions and advertisements. The Microsoft Store Spain page is listing the Lumia 950XL at €699 Euros (including VAT) and €599 Euros (including VAT) for the Lumia 950. The US Store page still lists Lumia 950XL at $649 USD but does not list a price for the Lumia 950. The US pages for both phones are still listed as coming soon, with no message equivalent to Microsoft Store Spain’s listing of a November 28th ship date. Stay tuned to WinBeta for more news as we await official announcements of the specific launch plans for the long awaited Lumia flagships. Are you planning to order either the 950 or 950XL unlocked from the Microsoft Store?